Posted by admin | Apr 25, 2013 4:51pm | No Comments on Earth Day, and an announcement! We had a fabulous time this week on an 800 person Earth Day event for our friends at CBRE. We went with a farmer’s market feel for this event, which worked nicely with the green feel. There were over 800 people at this event! It was held at 1840 Century Park East. It was also a great way for us to introduce ourselves to the building, because…. Garden of Eating is opening a cafe! The Garden Cafe will be open in mid-summer, at 1840 Century Park East. Come on by and enjoy our breakfast and lunch specials! We know how everyone loves a great pizza. The saucy-crusty-cheesy-savoryness is a major hit every time, for almost everyone. But if you’re tired of the heavy cheese, typical toppings, or tomato sauce, we’d like to show you some alternatives, and take pizza to an art form. Let’s talk sauce. You don’t strictly need it. You can swap out red tomato sauce with basil pesto, hummus, ricotta, or nothing at all! We like to take Trader Joe’s fresh whole wheat pizza dough and top it with a layer of hummus, big handfuls of arugula, shaved parmesan, a drizzle of olive oil, salt and pepper. It’s the perfect pizza for a quick weeknight meal. It’s a perfect opportunity to show off your creativity. Martha Stewart has grilled peaches, basil, and prosciutto. What an awesome flavor combination! You don’t even need an oven. Take simple grilled pizza dough (Martha shows us how here) and top with anything you think of! It could even be a great party idea. Let your guests choose from different sauces, different cheeses (including ricotta, Parmesan, manchego, marscapone, gruyere, or white cheddar, in addition to mozzarella), and all kinds of toppings. We think asparagus, bacon bits, fresh herbs, mushrooms, truffle oil, roasted potatoes, bell peppers, or whole cherry tomatoes could all be awesome. Offer traditional dough, whole wheat dough, and herbed dough. Add a few bottles of wine, some IPAs, and friends for a memorable evening! Equal parts delicious and hazardous, artichokes are a favorite food around GOE. In case you’re bored of mayonnaise and melted butter for dipping, we wanted to bring you a few ideas for this amazing (and dangerous) vegetable! Bagna cauda is a traditional Italian dip made with three (THREE!) heads of garlic, and generally eaten with raw vegetables. This recipe combines it with artichokes, and the result hearkens back to the standard mayo and butter we’re all used to, but in a uniquely Italian way. The Italians really do some wonderful things with artichokes. In this recipe, they’re stuffed with ricotta cheese and walnuts. And here, they’re braised in white wine and stuffed with parmesan, garlic, breadcrumbs, and sausage. Oh man… sign me up for one of those! If you’re inspired and want to go find the perfect artichoke, we recommend finding ones that are compact, and feel heavy for their size. You’ll need to remove the outer-most leaves, which are the toughest, so don’t worry about the appearence of them. You can take a knife or scissors and cut all the thorns off at once without worrying about losing any of the meat; the tops of the leaves are inedible. Here’s a great graphic on how to fully clean an artichoke. 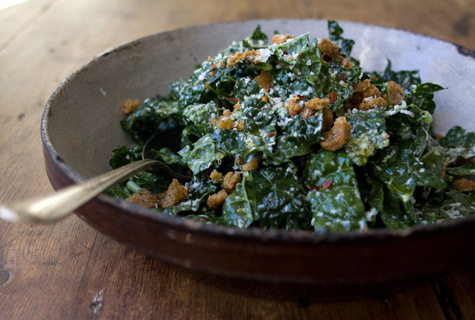 Here’s a raw kale salad from a fantastic food blog, 101 Cookbooks. So simple and tasty, it draws from the standard Caesar salad but without the anchovies. Salad not your thing? How about crispy kale chips? These are becoming so popular, you don’t even need to make them! You can get them in most super markets. Looking for a hot side? Try this sweet potato and kale hash. Our Account Coordinator took leftover sweet potatoes, crusted them up in a pan with smoked paprika, cinnamon, and garlic, gave the kale a quick sautee with olive oil and onions, and tossed them together. Served along side a nice piece of spice-crusted tilapia, this side was a smash hit! It would be great for breakfast with a fried egg on top and a crusty piece of country bread. Well we’re hungry! Next time you call in, ask us about doing a fresh kale salad with a citrus vinaigrette, some goat cheese, and pine nuts! Hi all! We hope your holiday weekends were spent with family and friends! Now that spring is in full swing, we strongly recommend enjoying some nice California weather with new and interesting cocktails! Bitters are a classic ingredient featured in many cocktials, most famously in the classic Old Fashioned. Artisan producers are creating bitters in a wide range of flavors, including celery, cherry, and lemon. However, did you know you can make your own bitters? Here’s a great recipe for Orange Bitters. Orange bitters can really add a unique zing to an Old Fashioned. You can even add a few shakes to Coke! Spring is all about the fresh produce! Here’s a really interesting cocktail you make with a little help from a juicer. It’s called the Verdant Passion. The lemongrass garnish is great! Couldn’t you just see a few of these on a table in your backyard, with friends gathered around on a Sunday afternoon? Mango and spice make everything nice, especially salsa, but they go great in a martini glass, too! Here’s the Absolut Mango Spice. Pair up these cocktials with some grilled shrimp skewers, grilled pork chops, or a fabulous array of fresh vegetables from the farmer’s market. The herbal, spicy, and fresh tones of these drinks will work great with grilled meats, lush salads, and balmy evenings.